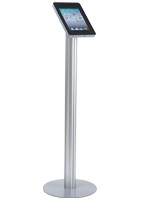 Structure designed for iPad 2, 3, and 4! These iPad holders are more than just displays or covers for tablets. 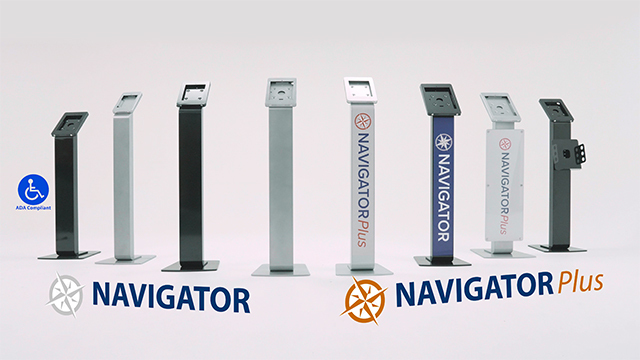 Flexibile functionality and robust security options will turn these portable kiosk stands into one of your top sales or marketing tools right out of the box. Constructed from steel for maximum durability, these iPad holders are finished in brushed silver for a look that will draw attention in any environment. 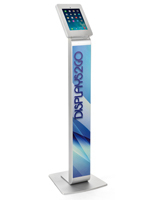 They look great on a tradeshow floor, in a sales booth, in lobbies and offices, even at a car dealership. 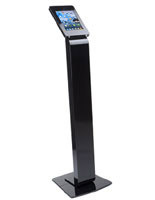 Easily assembled and easy to move, yet secure enough to use in high traffic areas, these iPad holders are perfect for getting information to customers and prospective customers. 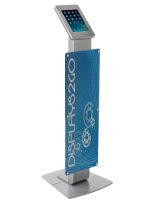 Perfect for information kiosks, product information, photo/gallery display, directory information, and device/application demos. In addition to providing excellent security and protection for the tablets themselves, the design of these iPad holders protects the devices from unwanted tampering or unauthorized program access. 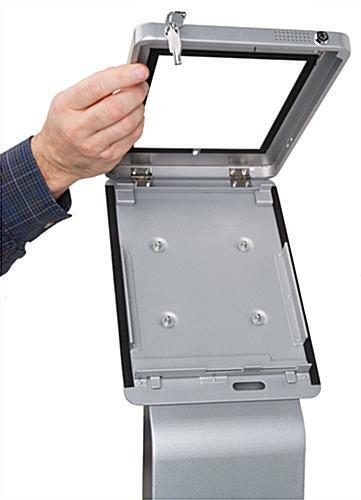 Security is built into these display mounts for tablets. 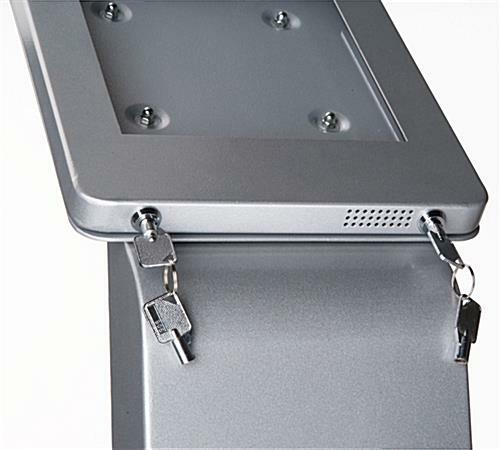 Dual locks on the display cases provide superb protection for the tablets within these iPad holders. 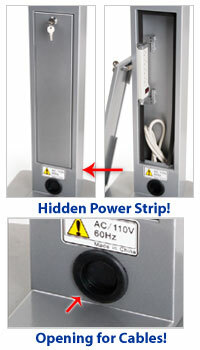 An additional lock secures the inner channel housing the included power strip as well as storage space for chargers and other accessories. 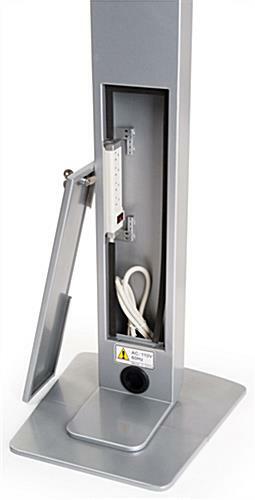 These iPad holders also include integrated power cord/cable management, to maintain a clean look and minimize clutter. 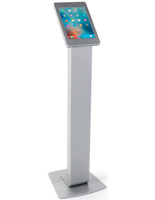 In addition to locking security, the display mounts of these pedestal/podium presentation stands are constructed to reduce unwanted access to software features and controls, leaving users with only the options you choose for them. 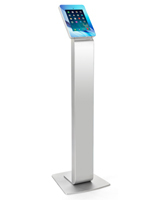 The display area in these iPad holders presents tablets in either portrait or landscape orientations for best viewing by users. 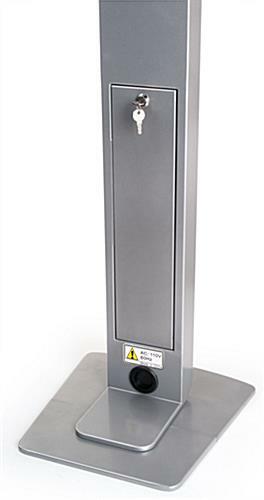 Please Note: This unit accommodates Apple® 2nd,3rd, and 4th generation & Air iPad design only! Although this unit holds iPads in portrait or landscape layout, the power cord along with the cable channel will be exposed while situated horizontally! Also, the home button access is covered.